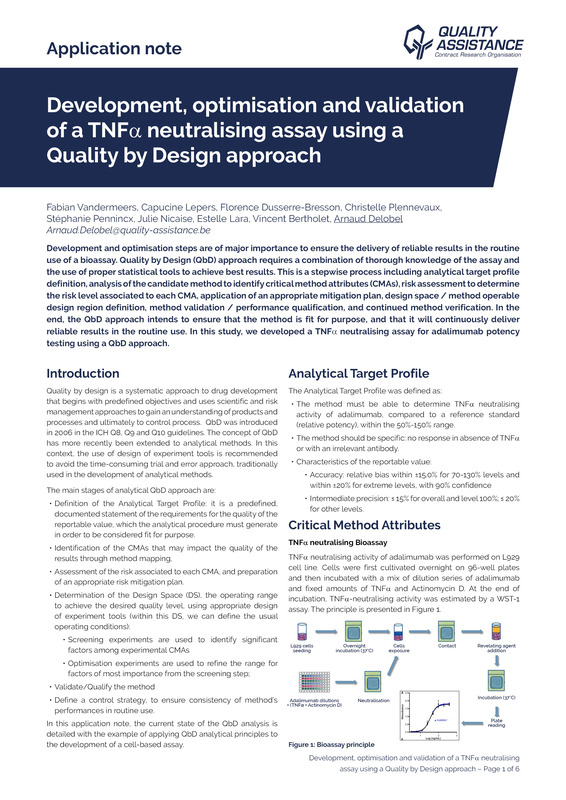 Using a QbD approach, we developed a TNFα neutralising assay capable of fulfilling the Analytical Target Profile. Statistical Design of Experiment was applied to evaluate the effect of the different factors and to choose the optimal parameters. Development and optimisation steps are of major importance to ensure the delivery of reliable results in the routine use of a bioassay. Quality by Design (QbD) approach requires a combination of thorough knowledge of the assay and the use of proper statistical tools to achieve best results. This is a stepwise process including analytical target profile definition, analysis of the candidate method to identify critical method attributes (CMAs), risk assessment to determine the risk level associated to each CMA, application of an appropriate mitigation plan, design space / method operable design region definition, method validation / performance qualification, and continued method verification. In the end, the QbD approach intends to ensure that the method is fit for purpose, and that it will continuously deliver reliable results in the routine use. 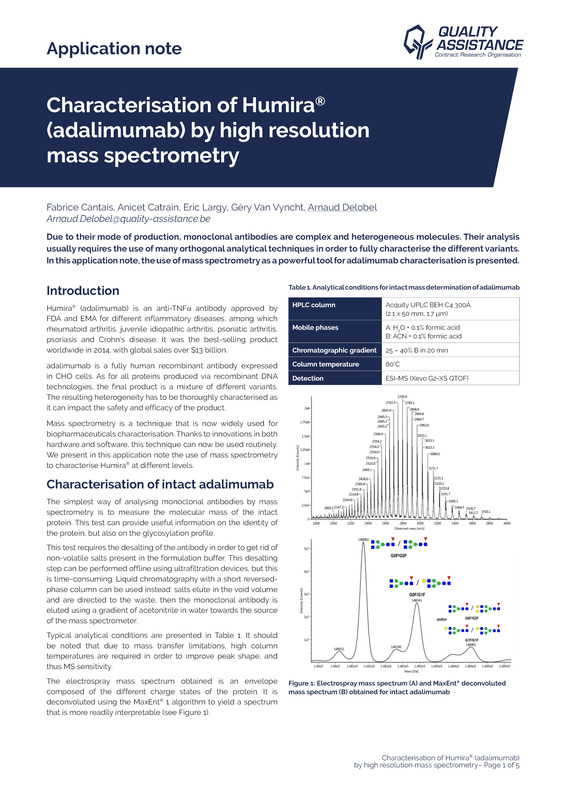 In this study, we developed a TNFaα neutralising assay for Adalimumab potency testing using a QbD approach. 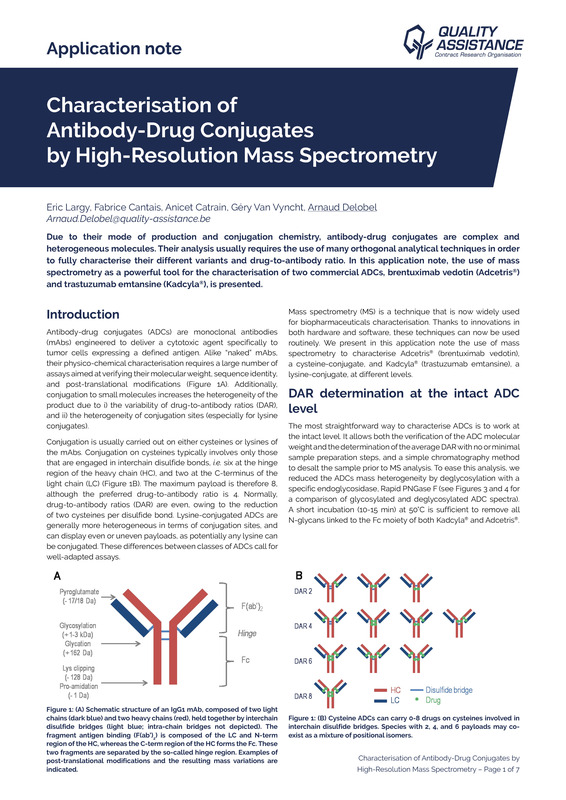 Using a QbD approach, we developed a TNFaα neutralising assay capable of fulfilling the Analytical Target Profile. Statistical Design of Experiment was applied to evaluate the effect of the different factors and to choose the optimal parameters. The performance of the resulting method was finally evaluated according to USP <1033> guideline. 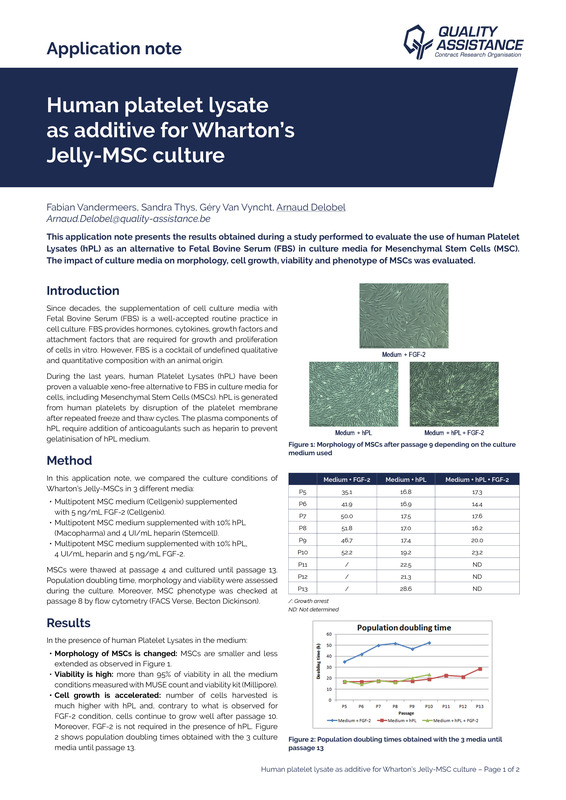 Results of the validation showed that a robust method was obtained with a satisfactory performance. In the end, QbD approach applied to method development helps to better understand the method variables, which reduces the risk of failure during method validation and the routine use of the method. 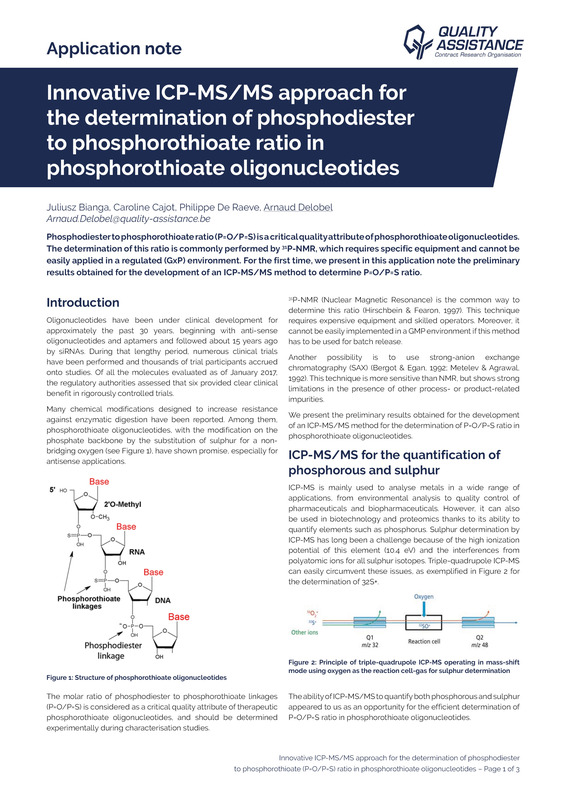 Phosphodiester to phosphorothioate ratio (P=O/P=S) is a critical quality attribute of phosphorothioate oligonucleotides. 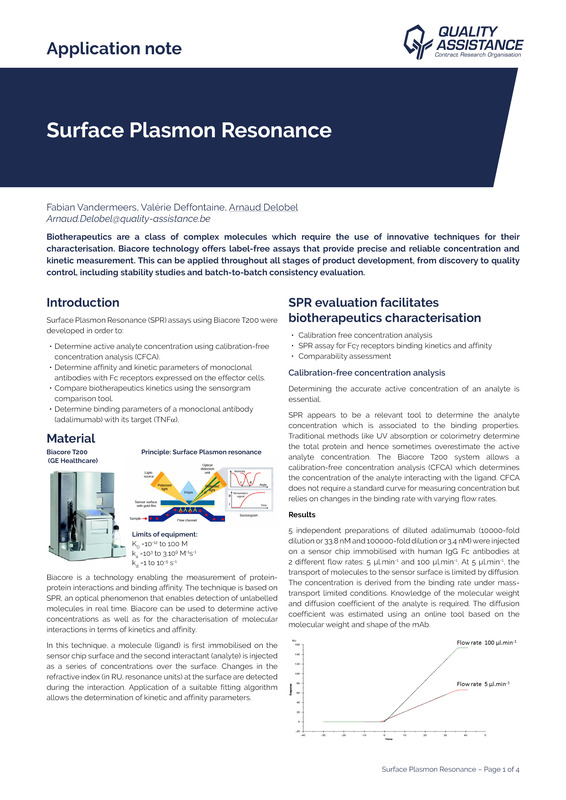 The determination of this ratio is commonly performed by P-NMR, which requires specific equipment and cannot be easily applied in a regulated (GxP) environment. 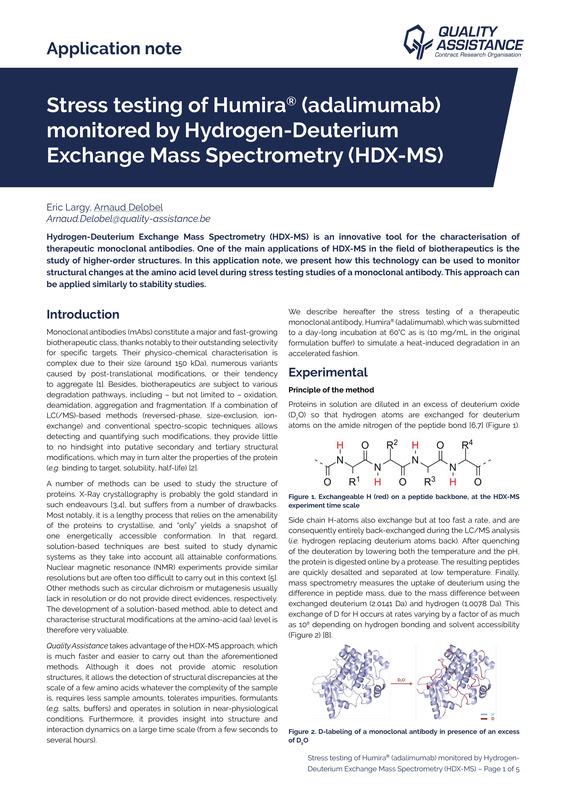 For the first time, we present in this application note the preliminary results obtained for the development of an ICP-MS/MS method to determine P=O/P=S ratio. 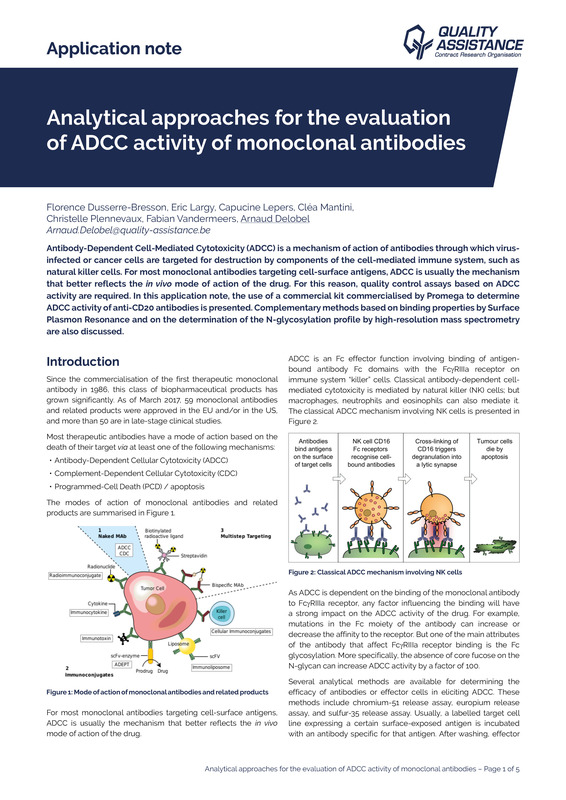 In this application note, we present how this technology can be used to monitor structural changes at the amino acid level during stress testing studies of a monoclonal antibody. This appreach can be applied similarly to stability studies. 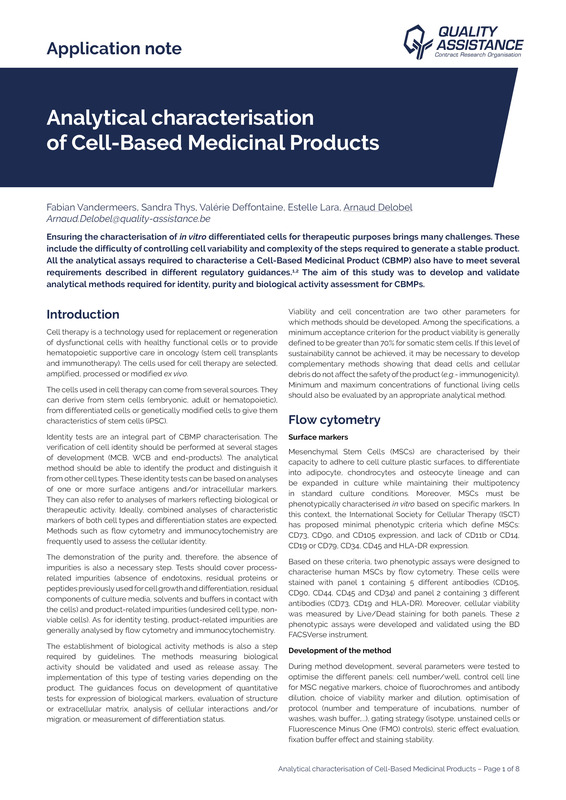 Ensuring the characterisation of in vitro differentiated cells for therapeutic purposes brings many challenges. These include the difficulty of controlling cell variability and complexity of the steps required to generate a stable product. 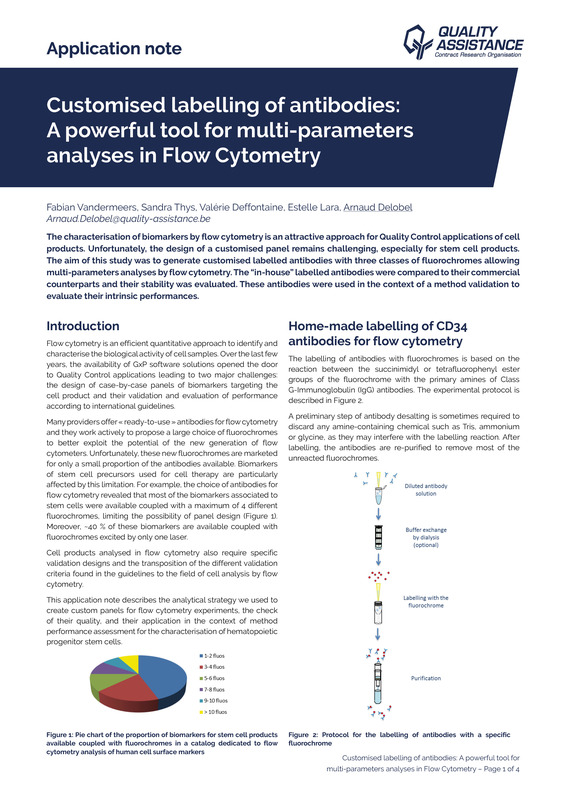 The characterisation of biomarkers by flow cytometry is an attractive approach for Quality Control applications of cell products. Unfortunately, the design of a customised panel remains challenging, especially for stem cell products. 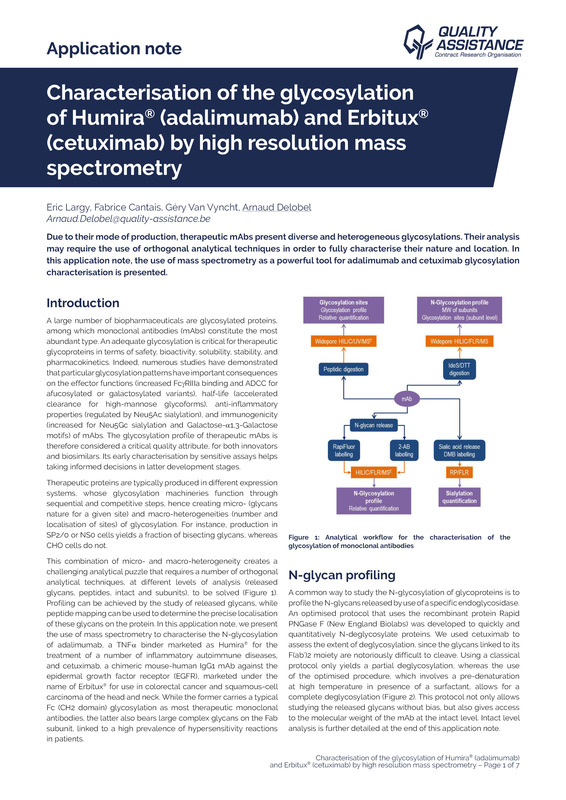 Due to their mode of production, therapeutic mAbs present diverse and heterogeneous glycosylations. Their analysis may require the use of orthogonal techniques in order to fully characterize their nature and location. Host-cell proteins are a major class of process-related impurities in biotherapeutics that can impact the safety and efficacy of the product. 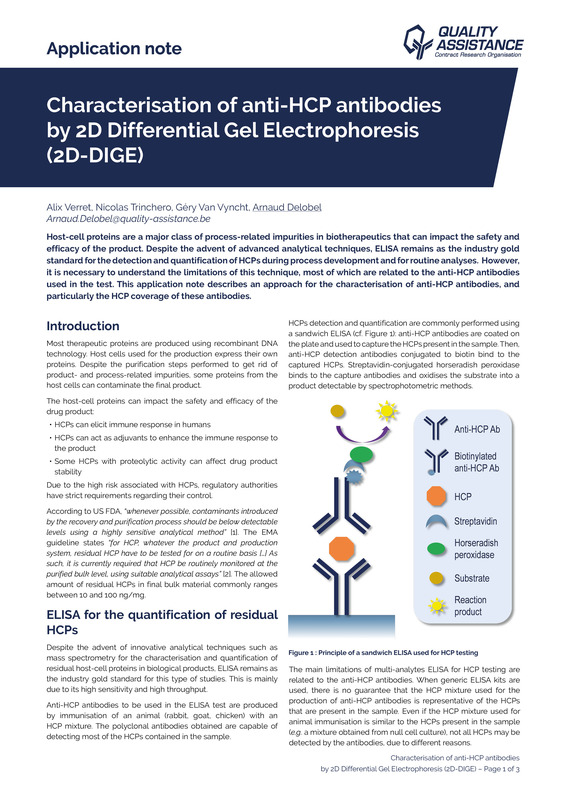 Host-cell proteins are a major class of process-related impurities in biotherapeutics that can impact the safety and efficacy of the product. 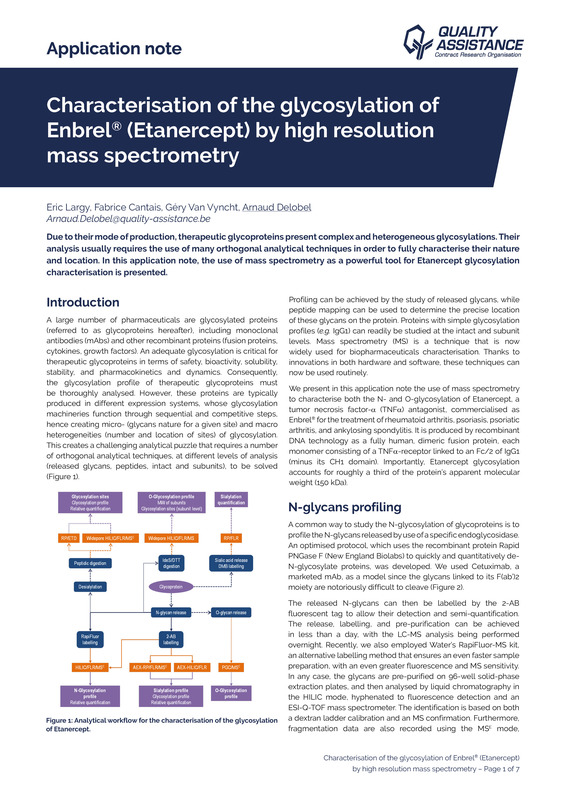 Despite the advent of advanced analytical techniques, ELISA remains as the industry gold standard for the detection and quantification of HCPs during process development and for routine analyses. Biotherapeutics are a class of complex molecules which require the use of innovative techniques for their characterisation? Biacore technology offers label -free assays that provide precise and reliable concentration and kinetic measurement. 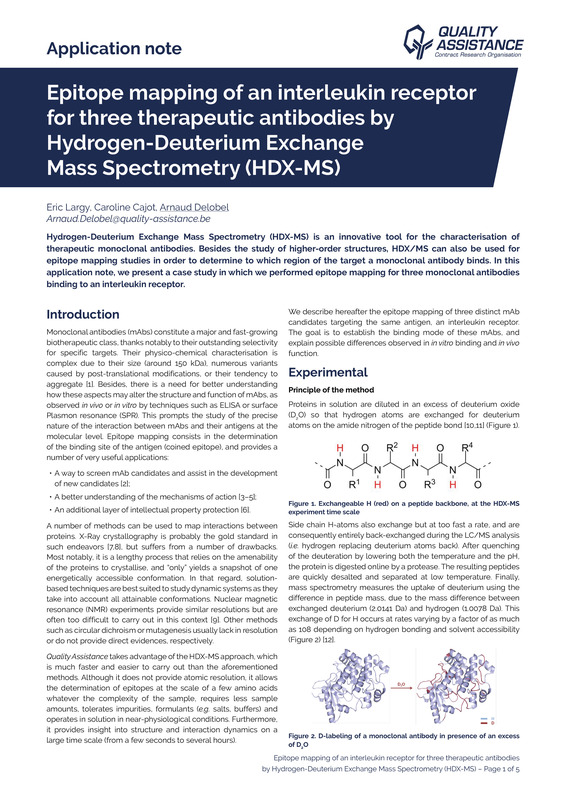 Inductively Coupled Plasma Mass Spectrometry (ICP-MS) is used increasingly in metallomic studies to analyze metals and metal species and their interactions within biological and ecological systems.